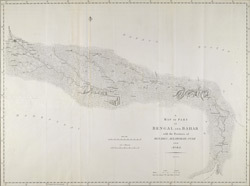 Engraving of a map of part of Bengal and Bahar by J.Cary. Plate 15 of William Hodges 'Travels in India, during the years 1780, 1781, 1782, & 1783' published in London in 1793. This map shows the area through which William Hodges travelled in the early 1780s. From east to west we can see Calcutta, Mongheir, Benares, Lucknow and Agra. Hodges had arrived in India in 1780 at the port of Madras. A year later, he travelled by boat to Calcutta with the intention of returning home. Instead, he was able to travel in Northern India sketching landscape views thanks to the patronage of Warren Hastings, the Governor-General of Bengal.